The molecule organises itself on the electrode surface until a dense, uniform monolayer is formed. 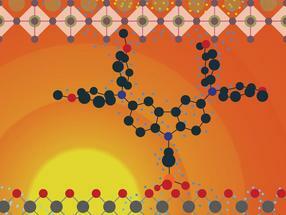 A team at the HZB has discovered a new method for producing efficient contact layers in perovskite solar cells. It is based on molecules that organise themselves into a monolayer. In recent years, solar cells based on metal halide perovskites have achieved an exceptional increase in efficiency. These materials promise cost-effective and flexible solar cells, and can be combined with conventional PV materials such as silicon to form particularly efficient tandem solar cells. An important step towards mass production is the development of efficient electrical contact layers that would allow deposition of perovskite layers on various substrates. Now the HZB Young Investigator Group headed by physicist Dr. Steve Albrecht, in collaboration with former DAAD exchange student Artiom Magomedov from Kaunas University of Technology (KTU) in Lithuania, has synthesized a novel molecule that self-assembles into a monolayer (SAM). The team successfully used this new material as a hole-conducting layer in perovskite solar cells. The molecule is carbazole-based and bonds to the oxide of the transparent electrode via a phosphonic acid anchoring group. Due to the anchoring fragment, this molecule organises itself on the electrode surface until a dense, uniform monolayer is formed. The ultra-thin layer exhibits no optical losses and, thanks to its self-organising property, could conformally cover any surface – including textured silicon in tandem solar-cell architectures. Extremely low material consumption is achieved with this technique, and the chemical structure of the SAMs can be adapted to the desired application. Thus, SAMs could also serve as a model system for future investigations of the properties of perovskite interfaces and growth. The work took place at the HySPRINT laboratory of the HZB where Albrecht's group is now conducting research on a new generation of self-assembling molecules, which already enable solar cells with efficiencies of over 21 %. Since this approach to perovskite solar cells has never been considered before and can potentially play a role in industrial processes, the HZB and KTU teams have filed a patent application on the molecule and its use.